The sable antelope is sexually dimorphic, with the male heavier and about one-fifth taller than the female. The head-and-body length is typically between 190 and 255 cm (75 and 100 in). Males reach about 117–140 cm (46–55 in) at the shoulder, while females are slightly shorter. Males typically weigh 235 kg (518 lb) and females 220 kg (490 lb). The tail is 40–75 cm (16–30 in) long, with a tuft at the end. 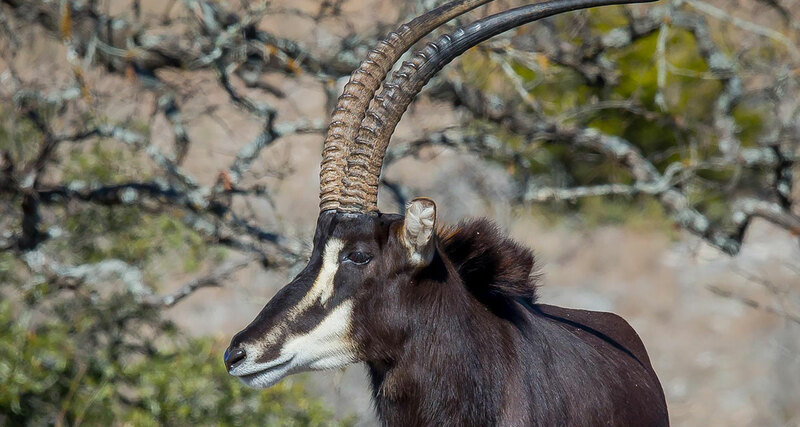 The sable antelope has a compact and robust build, characterised by a thick neck and tough skin. It has a well- developed and often upright mane on its neck, as well as a short mane on the throat. Its general colouration is rich chestnut to black. Females and juveniles are chestnut to dark brown, while males begin darkening and turn black after three years. However, in southern populations, females have a brown to black coat. Calves less than two months old are a light tan and show faint markings. The underparts, cheek, and chin are all white, creating a great contrast with the dark back and flanks. Long, white hairs are present below the eyes, and a wide, black stripe runs over the nose. Both sexes have ringed horns which arch backward. In females, these can reach 61–102 cm (24–40 in), while in males they are 81–165 cm (32–65 in) long. The average lifespan of the sable antelope is 16 years in the wild and 19 years in captivity. In each herd, the juvenile males are exiled from the herd around three years old. All of the female calves remain, however. When the herd gets too large, it divides into smaller groups of cows and their young. These groups form new herds, once again with only one adult bull. The young males, which have been separated from the herd, associate in “bachelor groups” of up to 12 individuals. Among the bachelors, the most dominant is the first individual to join a new group of females when the position is open. Seldomly, during their fights for dominance, they are able to inflict bodily harm to the contender. When sable antelopes are threatened by predators, including lions, they confront them, using their scimitar-shaped horns. Many of these big cats have died during such fights. Numbers have been reduced severely as part of regional tse-tse fly control programs. The grassland habitat of the sable is being reduced by habitat destruction for agricultural development. Antelope are important to their habitats as grazers and browsers. They are also important as prey for carnivores.